The avocado is a shallow rooted tree (most of the feeder roots are in the top 6 inches of soil) which needs good aeration. They do well if mulched with a coarse yard mulch. A coarse yard mulch is one that is woody and in pieces about 2 inches in diameter. Redwood bark will work and maybe cocoa bean husks and shredded tree bark. Coarse yard mulch is available at some garden supply centers. Be sure it is COARSE, not fine, yard mulch - and disease-free to prevent introducing diseases to your tree (like root rot). The current recommendation is to mulch with approximately 1/3 cubic yard per tree when planting. When applying the mulch, be sure to stay about 6-8 inches away from the trunk of the tree. They like the soil pH around 6 to 6.5. If you can, plant your tree in a spot protected from wind and frost. Also, avocado trees typically do not do well planted in lawns so try to plant your tree in a non-lawn area. Avocado trees like warm ground. Ideally, they should go into the ground from March through June. If they go in during the summer there is always the risk of sun damage because the trees can't take up water very well when young. Select a site that has full sun. Dig a hole as deep as the current root ball and just as wide as the width plus a little extra so you can get your hands into the hole to plant it. Don't drop the tree into the hole, the roots don't like that, ease it into the hole. The avocado root system is very sensitive and great care should be taken not to disturb the root system when transplanting. If the tree is root bound, however, loosen up the soil around the edges and clip the roots that are going in circles. Do not put gravel or anything else like planting media in the hole. The sooner the roots get out into the bulk soil, the better the tree will do. Planting mix creates a textural difference between the root ball and the bulk soil and causes water movement problems. If you have heavy, clay soil, elevate the tree on a mound to improve drainage. Make the mound 1 to 2 feet high and 3 to 5 feet around. Put down 20 pounds of gypsum spread around the base of the tree and mulch the area with 6 inches of woody mulch keeping the material about 6-8 inches away from the tree trunk. Read more about planting avocado trees. When watering the tree, it is best to soak the soil well, then allow it to dry out somewhat before watering again. Of course, like most plants, you don't want the tree to get too dry! The rule of thumb for mature trees is about 20 gallons of water a day during the irrigation season. Seedlings will require quite a bit less than that, of course. At planting, the trees can hold about 2 gallons of water in their rooted volume. Depending on the weather, they might use 1 gallon of water a day along the coast. Typically the trees need to be watered 2-3 times a week. As the roots reach out into the bulk soil, more water can be applied and frequency of watering diminishes to about 1 time per week by the end of a year. Check the soil before watering, to make sure it has dried somewhat. If the soil from around the roots can still hold the impression of the hand when squeezed, it still has enough water. Read more about watering avocado trees. The major nutrients that the avocado tree needs are Nitrogen - Phosphorous - Potassium (N-P-K on the fertilizer package label) and Zinc (Zn). For young avocado trees the recommendation is 1/2 to 1 pound of actual Nitrogen per tree per year. You can spread it out over several applications as long as it totals 1/2 to 1 pound of Nitrogen. The other important nutrient for avocado trees is Zinc. A general use home fertilizer that is used for houseplants normally should work. You may wish to feed in some zinc once a year if the fertilizer you are using does not have zinc. Read the package label to be sure. 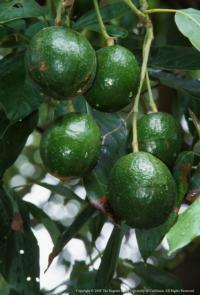 Read more about fertilizing avocado trees. Avocado trees greatly benefit from mulches. Any organic material can be used, including the fallen leaf litter from the avocado tree. It is best not to rake the fallen leaves. They provide free mulch for the avocado roots which are fairly close to the surface. 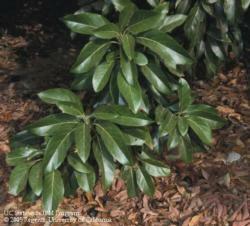 A thick layer of mulch can suppress some soil pathogens, including Phytophthora cinnamomi fungus which causes root rot. The climate zone you live in determines which avocado cultivars perform the best, when fruit should be harvested, and what pest and disease problems are more common. Avocados grow best where temperatures do not fall much below freezing, usually in coastal climates or inland where temperatures are moderate. There are two types of avocado trees,Type A and Type B, defined by the time of day that the flowers are open and are available for pollination. Each flower opens as female either in the morning (Type A) or in the afternoon (Type B). It closes, then reopens on the second day as male, and then closes permanently. This pattern occurs reliably when the temperatures are ideal - above about 70 degrees day and night. When temperatures are below about 60 degrees, or if pollinators are not present when both male and female flowers are open, fruit set is poor. Type B tree are planted to increase chances for successful pollination. Listed in the table below are recommended cultivars for planting in the home garden, with a general indication of maturity season. For photos and descriptions of many different avocado varieties that grow in Southern California, take a look at the UC Avocado Varieties page. You can expect your newly planted tree to produce fruit 3 to 4 years after planting. However, if growing from seed, it can take anywhere from 5 to 13 years or more before the tree is mature enough to set fruit. When the tree does flower, expect a lot of flowers to fall from the tree without setting fruit. This is natural. The Wurtz avocado tree, sometimes referred to as Little Cado, is the only true dwarf variety of avocado and will consistently produce good fruit from May to September. Compared to other avocado trees, which can grow up to 80 feet, a Wurtz avocado tree grows to about 10 feet. Due to its small size, the Wurtz avocado tree can be grown in a large container (such as a half wine barrel) and is a good option for smaller front and back yards. The Wurtz avocado is a hybrid created from the Mexican and Guatemalan avocado species, and produces abundant fruits within one to two years of planting if it is a grafted tree, grown in the right conditions and properly taken care of. This is the best Avocado variety for containers. A Wurtz avocado tree will do well in mild-winter areas of California. Avocados like loose, rich, well-draining soil. Plant in a container that has drainage holes, in good quality potting soil. The soil may need to be sandy to accommodate the tree's large roots and fast draining so that the roots do not succumb to root rot fungus. Avoid manure-based mixes, as these have a tendency to be too salty. Dwarf varieties in containers need frequent watering, perhaps even daily during the summer months, to keep the soil lightly moist. While the Wurtz avocado tree can tolerate temperatures as low as 25 degrees F, it should be kept in a warm environment as much as possible with protection against strong winds and frost. A young tree, one that is less than 12 months old, requires shelter from direct summer sunlight or the stems and bark will burn. After a year or two, the tree will grow enough foliage to shade itself from the sun. Fertilize with a well-balanced citrus food on a regular basis. Frequent pinching of young tree stems helps to keep the tree in the desired shape. If the Wurtz avocado tree is cared for properly, it will start growing flowers for pollination sometime between January and March within one to two years of planting, if it is a grafted tree. A grafted tree is a tree grown from seedling tissue that has been mixed with the tissue of a producing tree. Purchasing a grafted Wurtz avocado tree from a nursery is the easiest way for the home gardener to have a fruit-bearing tree. A tree grown directly from a seed will not start producing fruit until it is 8 to 20 years old. The Little Cado bears young. Once the flowers are pollinated, the Wurtz avocado tree bears fruit that ripens between May and September. The fruits are dark green and medium in size, ranging from 6 to 12 ounces. They have thin, shiny skin with small seeds. The fruits have been rated by growers as having a good and consistent flavor, with an oil content of 16 percent. Avocadoes will not ripen while still on the tree. Harvest when fruits are of mature size and still firm. They will ripen in one or two weeks at room temperature.